If you have a home business and want to increase traffic to your website, one of the most important things you can do is to select the search engine keywords that will draw traffic to your website. Google Trends is a keyword research tool that can help you see at a glance how many people are searching on Google for the keywords you're considering. Since Google is far and away the search engine of choice, focusing on Google keywords information provided can prove to be quite helpful. Search engine keywords are those words that Web surfers use to conduct a search in a search engine. A keyword can consist of a single word, such as "bicycles" or an entire phrase, like "ten-speed mountain bikes". Performing keyword research involves taking the time to discover which keywords your website visitors are most likely to be searching for, and among those search terms, which keywords your site has the best chance of ranking highly in search engine results pages. Efficient search engine keyword selection is a balance between the popularity of a keyword or keyword phrase (which Google Trends can help you with) and the competition that already exists in trying to rank for that keyword phrase. You can also use highly popular keywords as part of a Pay Per Click (PPC) advertising campaign, such as Google AdWords. Suggested bidding prices on more competitive keywords can be considerably more expensive, but since you can manage your daily limit for click-throughs, you may want to ante up to outbid your competitors, and still stay within your advertising budget if you believe the traffic for your selected keywords will result in a good probability that your PPC visits will ultimately result in sales. Google Trends can help with your pay-per-click advertising keyword selections, too. There are a number of free tools you can use to research how many times per day Website visitors are likely to conduct a search for your target keyword. One example is Digital Point's Free Keyword Suggestion Tool. Another is the free version of Wordtracker. Using these tools, you can type in the keyword "bicycles" and the tool returns numbers that represent how many times that phrase is searched for, along with the number of times related terms, such as "tandem bicycles", are used in search queries. You can then drill down farther by clicking one of the results, such as "girls bicycles", but Google Trends gives you important additional information in two areas. First, when it comes to the popularity of your search engine keywords over time, showing whether popularity is rising, falling or staying steady. Secondly, in comparing the relative popularity between two to five search engine keywords you are considering. Using Google Trends, you can compare how often your target keywords are searched for in a matter of seconds. For example, let's say you're not sure which would be a more popular keyword, "bicycles" or "bikes". Open Google Trends in your browser by going to www.google.com/trends or click the Trends link at the top of Google's search results page. Once the Google Trends tool opens, type "bicycles, bikes" in the box. You don't need the quote marks, but you do need a comma between each search term or keyword phrase you want to check. You can enter as many as 5 comma-separated keyword phrases at a time. When you're finished, click the Search Trends button. Google Trends returns a color-coded line graph that shows the frequency for which your specified terms were used in a Google search query for the past three calendar years. Using the bicycles, bikes example, Google Trends shows you almost instantly that the term "bikes" is used in search far more often than "bicycles" and that "bikes" has held this edge consistently over the entire timeline. Therefore, those who are looking for bicycles in Google are far more likely to use "bikes" in their search than they would use "bicycles". You might logically deduce this on your own since it's faster to type "bikes" than it is to spell out "bicycles". 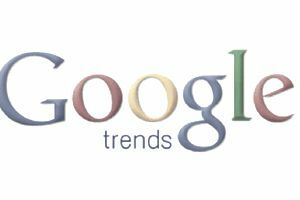 Google Trends is also a quick way to compare between the singular and plural version of your search engine keywords. Google Trends also allows you to compare at a glance the volume of news stories related to the keywords you're comparing and provides a bar chart that breaks down the results by selected cities, selected world regions and by selected world languages. Finally, Google Trends will also show a hyperlinked list of news references to those keywords. The comparison graph will show when those references were published on the web. What Google Trends doesn't tell you is the specific number of times your specified keywords were actually searched on. You only see a graph that doesn't show actual searches per day - just a comparison between time periods, between specified keywords, or both. But, you have other tools, like the Digital Point tool mentioned earlier and a number of others that can give you that information. Google Trends also doesn't tell you how competitive those keywords are - meaning the number of search results returned for those keywords. There are also free tools that can do that for you, or you can simply perform a search on "bicycles" and compare the number of search results to the number of search results for "bikes". If the number of results is low, you won't get any results at all, but Google will tell you that there were insufficient results. If no results are available, you may want to rule out targeting that keyword or phrase. After all, there's not much point in putting in a lot of time and effort to try to get good search rankings for keywords for which no one is searching. Likewise, information on competitiveness, which Google Trends does not provide is very important. For example, if the singular version of your keyword has 33 million results in a Google search, and the plural has 16 million results, you'll have a much better chance of ranking for the plural than the singular. Unfortunately, Google Trends doesn't provide that information.